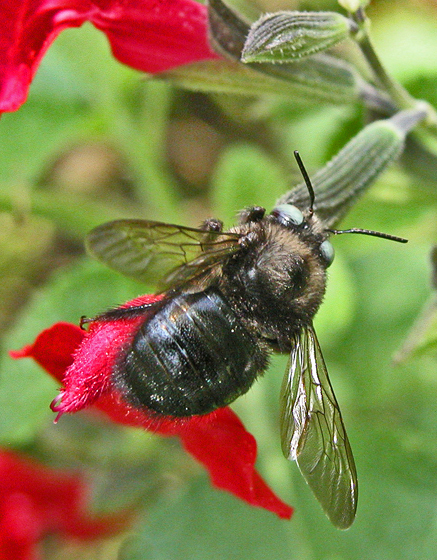 Scientific name: Order Hymenoptera, family Apidae, Xylocopa virginica. Identification: Similar to bumble bees but distinguished by a lack of yellow stripes and by shiny, hairless abdomens. They drill round dime-size holes in wood. See photos below. Biology and life cycle: Live in colonies in trees like cedar, redwood, and pine. Males buzz people within the bee's territory but have no stinger. Females do sting but rarely. After mating in the spring, females hollow out cells in wood and put a small pellet of pollen "bee bread" and honey in each cell. Each female lays a single egg next to each pellet, and the cells are then sealed with plugs of saliva and wood fiber. Larvae hatch and feed on the "bee bread." Usually one generation per year. Complete metamorphosis. Habitat: Boards of roofs, wood siding, decks, fence rails, and overhead structures. Feeding habits: Adults feed on nectar and pollen, larvae feed on "bee bread" made of pollen and honey. Economic importance: Pollination of flowers, especially passion flower and yellowbells. Also important for pollinating fruits and vegetables. Natural control: Birds and microorganisms. Organic control: Paint the wood or use wood stain. 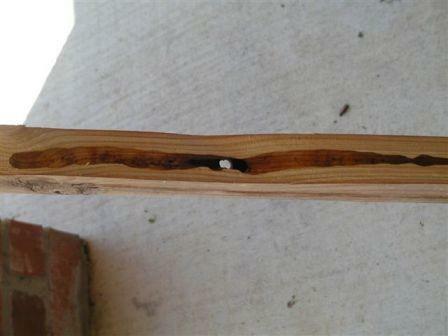 Treat the wood with castor oil, hot pepper mix, or plant oil products. Plant oil products will also work. 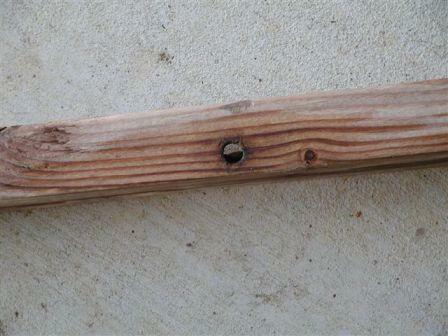 Insight: Carpenter bees are apparently lazy. They don't move around as much as other bees and are even known to puncture the sides of flowers to more easily reach the nectar. This habit is destructive to flowers. The organiphobes recommend Sevin to control these bees. We feel that this toxic poison should never be used. Tunnels made by the bee.